Do you hear ukuleles? The palm tree emoji depicts a brown trunk with bright green palm fronds, and it immediately conjures images of vacation, the tropics, and relaxation. Are we there yet? Bliss, paradise, vacation, relaxation…these are aspects of the tropical mental attitude that the palm tree emoji has come to represent. Then again, if you live in Hawaii, the emoji may make you think of your work commute, or maybe that tree out front that needs tending. It’s all perspective, right? 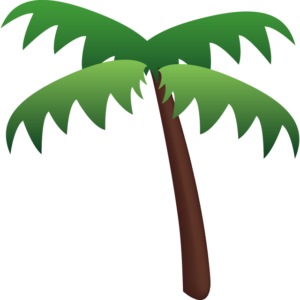 The palm tree emoji was approved as part of Unicode 6.0 in 2010 and added to Emoji 1.0 in 2015. In social media, you’ll see the palm tree accompanying posts that cover all aspects of tropical life and culture, from beachy sunbathing to a vacation-inspired cocktails to sunny picnics with friends. If you’re experiencing your own personal paradise and want to share that with the world, this is the emoji for you.